Remember Our March “The Deal Of The Month”! This is just a quick reminder of the March “Deal Of The Month”! All month long we will be offering our 4th Generation iPod Touch screen repair services for the sicking low price of $44.00! Do you have broken glass? No touch function? Ink blotch looking LCD screen? This repair service will cover all of those issues! This deal is is ongoing through the month of March and is good for both the white and black versions of the 4th Gen iPod Touch! Getting started is as simple as clicking this link: Deal Of The Month! We look forward to seeing your iPod Touch at one of our facilities very soon! Hello friends, it was pretty fun. Our first customer at our new retail location was a gentleman by the name of Jim G. (and his wife) that actually stopped in 2 days before we opened as I was “testing” out our open sign. My 3rd grade daughter dropped her iTouch and shattered the screen. 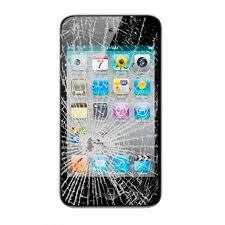 I would have taken it to the Apple store for repair, but the atmosphere in Apple stores annoys me, so I typed “shattered screen 5th generation iPod Touch Kansas City” into my web browser search bar. The top result was Mission:Repair. I looked at the hours of operation and realized there was only 30 minutes before they closed and I had a 20 minute drive to get to the store. We made it to the store with 10 minutes to spare. We walked into the establishment to the dismay of the owner and his mother. Why dismay? Well, when I found the store location on the web and I didn’t realize this was a new location and wasn’t yet open. The front door was unlocked so the owners could carry items from their cars into the store, but it wasn’t open to walk-in traffic. So… We walked in, and apologized for showing up so late in the day, but needed to get my daughter’s iPod repaired. The owner explained they open for business on Monday (March 17), but he was excited I found the store and helped me despite the fact they weren’t actually open for business. He had his sales/order system up and running, so he was able to put me into the system and get a ticket for my order, but since the store wasn’t fully functional he couldn’t print the ticket (he was able to email it). He apologized for not having “something to give me saying he had our iPod”, but it wasn’t a big deal as I had already received the email on my phone. He told me he would be in and out of the store over the weekend and would have the iPod for me the next day, Saturday (as I later would find out, they offer next day service on all iPod and ITouch repairs). We went back to pick up my daughter’s iTouch and was thoroughly impressed with what happened next. The owner’s wife was there and she was so grateful to us for being their “1st customer” at the new location. She then explained how she and her husband wanted to offer us a significant discount on the repair and also gave us three gift certificates to help spread the word about their company. We told her we would absolutely spread the word as their customer service went above and beyond what anyone should expect from the owner’s of store that is not officially open. Hoping we don’t require anymore repairs to our devices, but if we do, we will definitely be using Mission:Repair! So there you go, a great story from a wonderful couple that just needed a little bit of help with their cracked iPod glass. We are on a fantastic roll out at Mission Repair Express, and we encourage you to come visit us. We are now open daily, 8am to 7 pm Monday through Friday, and 10am to 5pm Saturday ad Sunday. Our ribbon cutting is taking place on 4/1/14 at 4:30…be sure to come out and stop on by for some cookies, coffee and surprises. Thanks again for all of our newest customers that came to our Express location, we appreciate each and every one of you! Do you have broken glass? No touch function? Ink blotch looking LCD screen? This repair service will cover all of those issues! This deal is is ongoing through the month of March and is good for both the white and black versions of the 4th Gen iPod Touch! Getting started is as simple as clicking this link: Deal Of The Month! We look forward to seeing your iPod Touch at our facility very soon! Deal Of The Month – March! Among all of the moving and shuffling around we have had this and last week, we were actually able to sneak in an awesome “Deal Of The Month” and I wanted to talk to you about it, before I go back to moving heavy objects. This month we are featuring our ever popular 4th Generation iPod Touch screen repair services! When we originally announced these repair services back in 2010, we could of never imagined how many people we would be helping. Its amazing that 4 years later, this service is still one of our top sellers! Something else that is hard to believe, is how far we have been able to drop the price for this service! After a certain amount go time, you will see most of our services drop, its just a natural occurrence, but nothing has come close to the price drops that we have seen for the Touch 4 cracked glass services. What started out as a reasonable $129, has seen price drop after price drop and has landed on the incredibly low price of $49.00. For this kind of cash, there is no reason to “deal” with a cracked screen. For the month of March, we have decided to take it a step further and make it just a little bit easier to get that repair going! We are taking an extra 10% off of these services and you can get started right now by clicking on this link: Deal of the Month! With that, I’m off to lift some desks that weight about the same as a VW Bug… Wish me luck and if you don’t hear from me in the next day or so, please send a search party.